Sweet potatoes are an absolute staple at most Thanksgiving tables, but some of the traditional sweet potato dishes just don’t do it for me. Especially that one with the canned yams and marshmallows? Blech. Can’t stomach it. I do like mashed sweet potatoes, but when you have traditional white mashed potatoes, sometimes you want to change things up a little bit. This recipe is a perfect hybrid of a classic dish with a bit of an easy, upbeat twist. 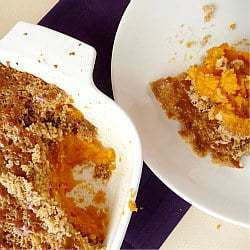 Mashed sweet potatoes are spread in a gratin dish, topped with chopped walnuts and baked, and then sprinkled with brown sugar and placed under the broiler quickly to get a sweet, crackly crust reminiscent of some of the best crème brulée. 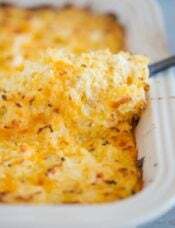 This is a great side dish for Thanksgiving, especially because you can make the potatoes ahead of time (even the day before), then just give them a quick zap in the microwave to heat them up, mash them with the butter, season and then throw into the oven. The bake time is super short, so you could pop it in the oven as soon as the turkey comes out and you’re carving. I can’t believe that Thanksgiving is less than a week away! On Monday and Tuesday you’ll find recipes for some great (and different!) rolls and a traditional stuffing. Then make sure you check back next Friday for a great recipe to use up a lot of your leftovers! I am taking this to the family gathering. 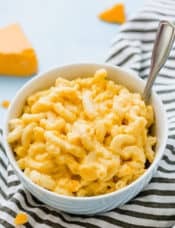 Should I prepare it completely and warm it up at dinner time, or should I do the brown sugar part after I arrive? I hope you see this in time! Hi Brenda, I’m sorry I didn’t get to this in time yesterday. You could really do it either way, whichever is more convenient for you. 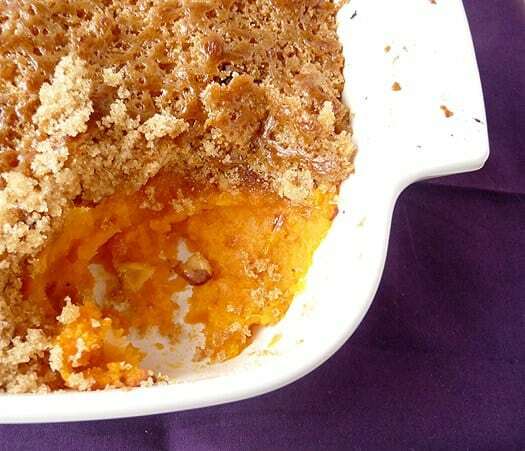 This is VERY similar to the Sweet Potato Casserole Recipe I grew up with…mash baked/boiled or canned sweet potatoes and mix with butter, eggs, vanilla, sugar milk then spread it all in a dish…then, and here’s MY sweet potato casserole tip, I put the casserole in the fridge for a while to allow it to firm up some. It really makes getting the topping spread on much much easier. The topping is a mix of chopped pecans (Southern girl here! ), flour, butter and brown sugar and it’s spread or “plopped” on top. 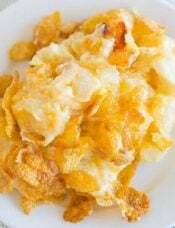 It makes a crispy crunchy sweet and salty bubbly amazingness over the light and fluffy sweet potatoes. 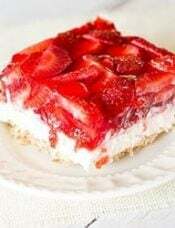 Everytime there’s a potluck or family meal I’m asked to make this and many times it’s eaten as dessert instead of the side dish! Hey Michelle! I have canned sweet potatoes, would those work?? Please help! Hi Nicole, I think you could use those, no problem. I have canned sweet potatoes… Will these work?? And what about regular brown sugar? Hi Nicole, I have never used canned sweet potatoes but I think as long as it doesn’t include any other seasonings or anything they should work out okay. Regular brown sugar is light brown sugar, I just put “light” in there to differentiate from dark brown sugar, which contains more molasses. Clever idea for sweet potatoes. 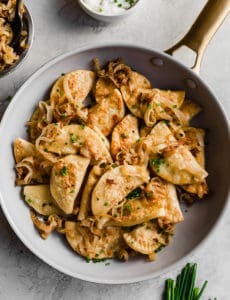 These potatoes look so delicious. What a nice addition to the Thanksgiving dinner! 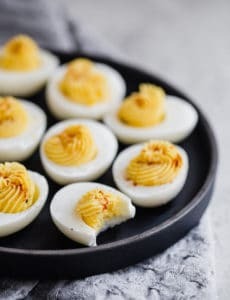 I would just like to thank you for sharing this recipe. I made it today to serve to my guests on Thanksgiving and it was a huge hit! It was so easy to make and so delicious. This will be permanently replacing my sweet potato casserole. Thanks again and happy Turkey Day! You are so welcome Annie, I’m glad you and your family enjoyed this. Hope you had a wonderful Thanksgiving! Mmmm, looks fabulous as usual Michelle!! xoxo Have a great weekend! That topping looks incredible! I think if that dish was at my end of the table no one else would get any! I think by the time Thanksgiving comes I’ll be full from trying out amazing recipes. Very creative idea with potatoes. I can’t wait to try this in a pie form. Now I’m faced with a dilemma. . . my Slap Yo Mama Good Sweet Potatoes or these? Your topping is wooing me. I love the twist on the traditional sweet potato casserole. It is so hard to do anything but the classics on Thanksgiving without people throwing a hissy fit. I think that it is close enough to the original that people will like it. I found my side dish! I think I’m in love! This looks so devine! 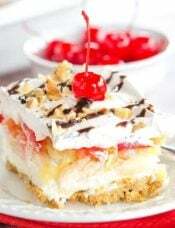 If I was at the table, I would be caught with my finger in the casserole dish, picking off and eating all of that gorgeous topping! Looks great- love your spin on the SPs! You just made me want sweet potatoes!! I think I might make this for my fam next weekend. I’ve made a version similar to this for years – I use pecans instead of walnuts. 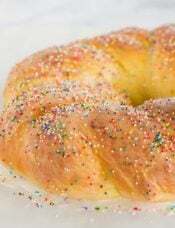 Friends request the recipe and family always expect on the holiday table. Delicious! I’ve been on the lookout for some new sweet potato recipes this year… I’m sick of the “same old” candied yams that I usually make. 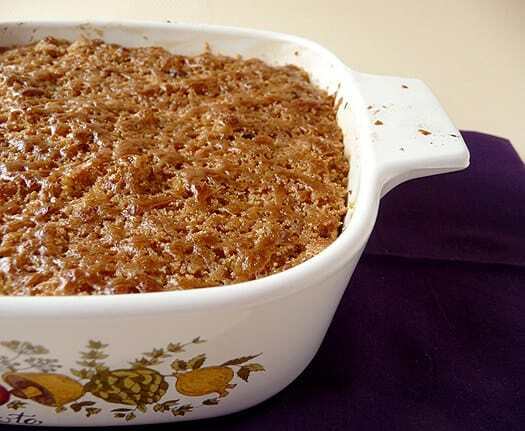 Loving the look of this casserole… especially the bruleed top! What a nice riff on sweet potatoes for Thanksgiving. i am sure that using maple sugar would also ramp those babies to unknown heights! Thank you for the cool post! That looks delicious! And I like your vintage Corningware pan. 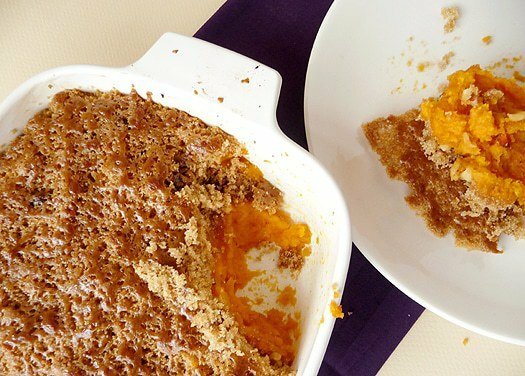 i do love sweet potato casserole topped with marshmallows, but i love this variation and idea to brulee the top ! I love mashed sweet potatoes! The brulee version sounds incredible! 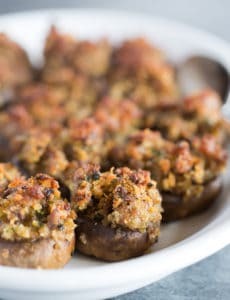 You have some really interesting recipes for Thanksgiving! I share your love of sweet potatoes and always have some in my vegetable bin, because they are a wonderful snack. This I have to try! Caramelized sugar, the crunchiness and the fusion of flavors,heavenly. I think it’s clever to use light brown sugar, if we use muscovado this will look too dark. Thank you!